Posted 17th April 2018 & filed under Blog. 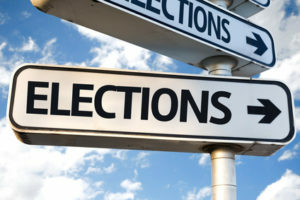 The local elections that are due to take place on 3 May are quite important. All 32 London boroughs have all their seats up for grabs, and outside London typically a third of seats are at stake in the various other councils – Metropolitan Boroughs, District Councils and Unitary Authorities. Also, in some areas the mayor is being elected, including in Hackney, Lewisham, Newham and Watford. This election is also a bit novel in that the Electoral Commission is trialling the use of ID in a few areas, including Swindon, Bromley and Watford – in an initiative designed to combat electoral fraud. 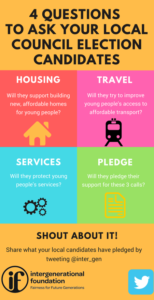 for local services for young people, which have been slashed in recent years. Will the historically high turnout of the last general election (“youthquake”) be repeated in the local elections at the beginning of May 2018, so that politicians start to take more account of young people? They might really do so if all the students who could, exercise their right to vote twice. In this way they could chalk up a turnout of over 100% – probably the only demographic where this is actually feasible. The official justification is that they have two homes, both of which they are genuinely living in rather than just visiting. Voting in all regions is on a single day (3 May 2018), so students with two votes either need to travel between their homes on that Thursday or cast one of their votes by postal ballot. The way to get a postal vote will seem rather old-fashioned to Millennials – you have to apply to your local Electoral Registration Office using a paper form. Also it had to be submitted by 18 April, so probably too late for this election unless you already have postal voting set up. OK, so it’s not going to make a big difference this time round. But it might one day, if students put their minds to it. And why not? As students have a bigger stake in the future – they’ll be around for longer than most people – it seems reasonable that they should express their opinions more than once.